To illustrate the zone of influence Fade Radius and its effect, the bitmap picture will be swapped with a grid pattern. There is an area called the deformer Fade which surrounds the region of influence; this is the link between the strict boundaries of the zone of influence and the surrounding region. This area gradually stretches or squashes following the deformation. 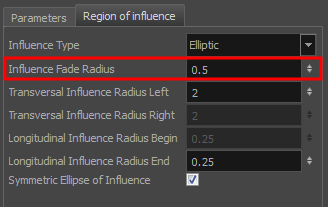 You can change the Fade Radius value to modify the size of this area and the exponent of the deformation fade effect. 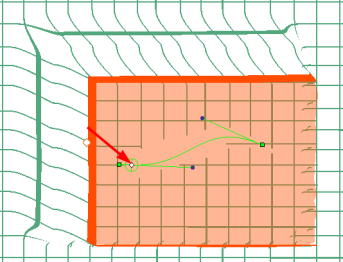 If you built a custom deformation system from the Node Library view and are using a Deformation-Switch node, you can change the default behaviour so the fading effect is inside the zone of influence instead of outside. This is explained in this example. In the Node or Timeline view, select the deformation group or nodes containing the deformation chain you want to set the region of influence for—see About Deformation Control Display. In the Layer Properties window, under the Region of Influence section, adjust the Influence Fade Radius field to modify size of the fading area. The default value is 0.5. 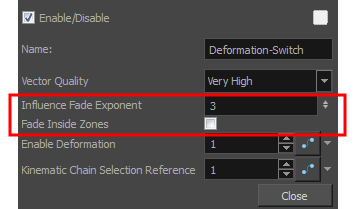 If you built a custom node structure, using deformation nodes from previous versions of Harmony and are using a Deformation-Switch node, you can also set the fade radius there. 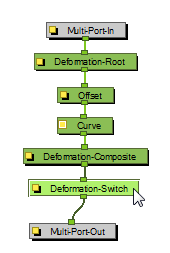 In the Node view, select the Deformation-Switch node under the Deformation-Composite node in your deformation chain. Influence Fade Exponent Modify the exponent value or type the exact value in the field. A value of 1 is similar to a linear curve. A higher value will result in an ease-in type of curve. A lower value will result in an ease-out type of curve. Fade Inside Zones By default this option is disabled, meaning that the Fade effect will occur outside the zone of influence. You can enable this option so the fade effect is inside the zone of influence.